After a particularly difficult day of meltdowns, hitting, biting and screaming, Missy disappeared into her room and reappeared with this note for us. 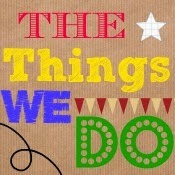 This blog post is my entry into the Tots100/PartSelect ’Love Your Appliance’ competition. We've recently bought a new freezer because our old one packed up (thankfully it was fairly empty). I can't be without my freezer, it's so convenient and means leftovers can be saved for another day. However, it always seems to be freezers that conk out in our family. With Christmas fast approaching, you can bet the mention of a freezer will trigger someone in the family to tell the story of when our freezer broke down one Christmas. I was about ten years old at the time. Frozen food was the in-thing in the 70s with lots more households buying their first freezer. Mum had filled our freezer to the brim for Christmas as she liked to put on a feast over the festive period and we usually had various relations around. Unfortunately this particular Christmas morning, before we sat down excitedly to open our presents, Dad discovered a problem - the freezer had bust overnight. Of course, there was nothing that could be done to fix it and even Santa couldn't have done his magic that day and magically make a new freezer appear. Mum didn't want any food thrown away so saved what she knew could be safely defrosted and used over the next few days. Croquette potatoes and chicken vol-au-vents for Christmas lunch was a new one for me, whilst fish fingers for supper was even stranger. But what to do with the rest of the food that we didn't want? Well, since it was the time for giving, why not give our food away to the neighbours. So off we went. Frozen prawns to Mr Fisher (how apt), frozen veg to Mrs Mitchell, a gateaux to number 30, Crispy Pancakes to another neighbour and various other 1970s delights to our delighted neighbours. They thought Christmas had come - oh, wait, it had! Sadly for our neighbours, our freezer never broke down again at Christmas but the tale has been remembered for many years. I must remember to check the freezer on Christmas morning. Missy has been really angry for the last couple of months so when I received an newsletter from PAC mentioning a public seminar called "Living with the Angry Child", I knew I had to attend. Thankfully, our local authority paid for me to go. The speaker at the seminar, attended by about 70 people, mostly parents, some professionals, was Holly van Gulden, a worldwide expert in child development and who works a lot with children in care. She was brought up with her birth parents and they also adopted four children. She is an adoptive parent herself, so is very experienced to talk about the subject. The seminar was held near Euston station in London, a mainline station with some trains heading to the north of the country. I had a fleeting thought of jumping on a train and disappearing for a few days. I think I even said it out loud! However, I didn't, I went to the seminar via the coffee shop where I treated myself to a massive almond croissant. One thing I love about attending seminars and workshops is that other attendees know exactly what you mean. They are going through the same problems, the same tantrums, the same behaviours with their children and are experiencing the same emotions as me. I immediately warmed to Holly, a 60-something from Vermont USA. She spoke to our hearts - I was in tears after only 20 minutes and had so many lightbulbs going off in my head that I should have worn shades. She was funny, she was serious, she spoke our language, not some pyscho-babble. She talked about permancy and constancy, two building blocks for attachment and it's clear Missy experiences neither as fully as she would if she'd had a normal, healthy upbringing. She talked to us about the pyschology of anger and how this appears in our children, and ourselves, and gave us some techniques to de-escalate the anger. Permancy is "the capacity to take it for granted that the item, or person, or the self continues to exist when out of sensory contact" whilst constancy is "the capacity to take it for granted that no matter what part of the other or the self you are currently experiencing, all the other parts of the other or self continue to exist". We have to remember that Missy, at times, is not acting as a 6 year old, but as a much much younger child who hasn't normally would not have yet developed these capacities. Two of the many lightbulbs for me were that attachments are sensory, not cognitive, so talking/talk therapy does not help here. Holly also mentioned "to have and to hold" - of course this is a phrase used when there is a strong attachment between two individuals, ie. at a wedding. With our children, they may well have and show signs of attachment, but their ability to hold it long term is not there. Without constancy, the child assumes they are being abandoned as soon as they perceive, rightly or wrongly, there is discord, tension or disapproval. Without self constancy, the child has difficulty controlling impulses, difficulty with transitions, refuses to accept direction and rages for no particular reason - that's Missy to a T.
I'm just re-reading my notes as I type this blog post. Even now, I'm getting some lightbulb moments and we have much to put into practice. 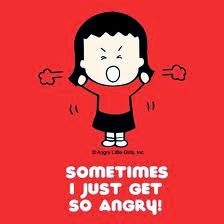 I tried this morning but angry child with her primal scream and ability to physically (and at times verbally) hurt was not for calming. This morning I could not help but break down in tears which Missy saw and ten minutes later had calmed down and apologised. I know Rome wasn't built in a day and the techniques I learnt yesterday and those that Daddy is reading in 'From Fear to Love' by Bryan Post, will take some time to work. I hope I haven't jumped on a train before they do. Missy loves her art and making things. This week she made this bracelet for me. Quite fitting I though, considering it's National Adoption Week #NAW2013. 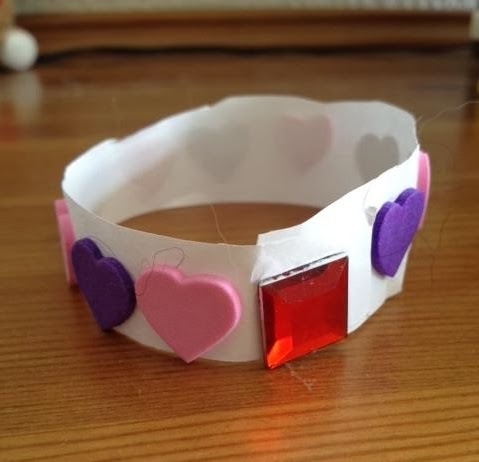 It's a Love Bracelet and if I feel I need some love during the day whilst she's at school and Daddy is at work (she hadn't quite understood that Daddy isn't working at the mo), then I should press the square gem and love will pour out of the bracelet from her and Daddy to me. How lovely is that?! I nearly shed a tear when she gave it to me. For all her anger, Missy can also be extremely thoughtful and sweet (and creative). In return I sewed and stuffed a little heart, made with material with hearts on, that she has in her school bag so she can do press if she needs some love from us during the day. I know I write about the negatives a lot, I guess it's because they consume us more. But it's little things like this bracelet that make me remember why we adopted, why adoption is so important and why, albeit with more research and support, I would thoroughly recommend it. We've done it, we've posted the adoption application paperwork. 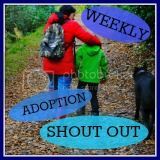 It's quite appropriate really that we've sent it this week and it's National Adoption Week. No idea how long things will take now so I guess we just sit back and wait. I'm quite glad to get it out the way really. So, last week was half term and Daddy was off all week (actually he's off all the time now, hurrah!, until he find a new job). Half term went ok actually. We had some lovely days out, including doing one of our favourite walks down by the river. This time last year we went on the same walk and Missy moaned constantly, but a year on she enjoyed it (probably helped by the stop at the riverside cafe). We also went up to London for the day where we climbed 311 stairs up The Monument, went to Borough Market (Missy tried Vietnamese curry and loved it) and went to the Tate Modern. I do love that kids say what they think, and where better than an art gallery. I'm not a huge art lover although I do love Monet and do like visiting the National Portrait Gallery, but I'm afraid I just don't get some of the abstract stuff at Tate Modern. I mean, come on, a plain canvas with a cut in it, an old pair of net curtains and another canvass painted entirely in black - I just don't get it. Missy can do miles better. I loved her thoughts on one particular picture - a canvass painted in blue with a white shape and a couple of other shapes which was supposed to represent a horse in a dream - "it's rubbish! ", said Missy, not too quietly. I laughed. We left soon afterwards and headed up to Leicester Square for a massive treat, taking Missy to the Haagen Daz cafe. Ice cream?! For dinner?! Well, it was a treat and it wasn't a school night. Not surprisingly, she didn't sleep on the journey home. One day last week we had to get my Mum over to babysit for the morning as I had an appointment at the breast clinic. I had experienced some pain and felt a small lump, even though I'm fairly lumpy anyway. Four hours we there! Not the best experience of my life, mammograms are bloody uncomfortable and the hospital itself is so drab it can send you into a state of depression just sitting there. Just relax, said the radiographer. I can't with the plate sticking in my bloody ribs! Anyway, all is well. Although with all the stress of the last two years, I wouldn't have been surprised if news had not been so positive. I'm glad we waited to send in the papework because if results had shown something wrong, I'm not sure how we could have gone further with the adoption legalities. Since my last blog, we've also had Parent Consultation Day at school. It's good to know that Missy is doing ok academically, no worries from the teacher, although numbers isn't her strong point. Not surprisingly, it's the social side of things that Missy still has problems with. If someone isn't sharing, or tells tales, it's most likely that Missy will be the one who starts to wail. She's been wailing a lot lately. But generally, she's quiet at school, but as I explained to teacher it's because she is being compliant and her lack of self-esteem means she desperately wants to please. Teacher is going to have a think about how to help Missy and we'll have a longer discussion at the forthcoming IEP meeting. Sometimes I just can't fathom what triggers Missy's change of behaviour, but I guess sometimes there is just no answer. Yesterday she specifically asked for a plait in her hair, and stood there happily whilst I did it. As soon as I finished she turned and shouted "But I didn't want a plait in my hair! ", and proceeded to have a tantrum. This morning she growled at us and showed her teeth - honestly, it's very disturbing to see a little 6 year old girl act like a dog. Harsh to say that but if you saw her you'd think the same. Trying to comfort her is difficult as she screams she doesn't want anyone to touch her, but leaving her to calm down also results in further tantrums. Sometimes she can regulate herself and at other times she can't, and quite often we don't know what to do either. I think Daddy and I need to have another review of our parenting style - I've been reading about "Love Bombing", a technique from Olive James, where you literally bomb your child with love whilst giving them a day where they can choose what goes. Sounds simple, sounds also a recipe for disaster but testimonials are positive so I'll let you know how we get on once we've tried it. In other news, I actually really like the new Little Mix and One Direction singles. There I said it, and I'm no teenager.